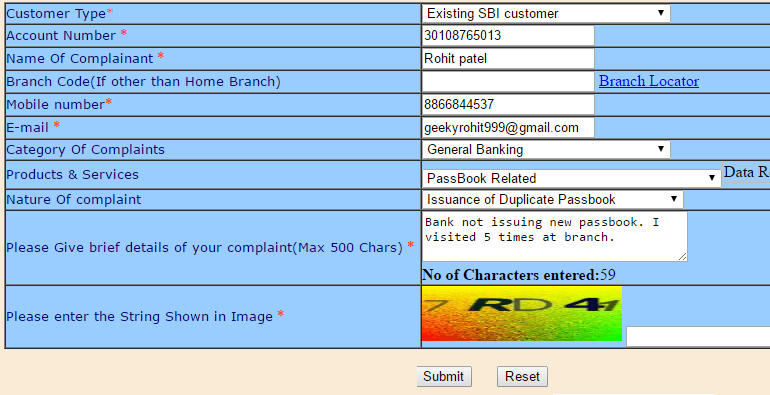 Do you have a complaint with SBI (State Bank of India) regarding your account? Now SBI customers can register their account related complaint online and get resolution within 7 days. State Bank of India is the largest and most reputable bank in the country. You can apply for saving account online by filling online account opening form or open a digital account through YONO. If you are existing SBI customer and facing any issue related to your bank account, transactions, net banking or something else, then submit your complaint online through SBI complaint form. Now you need to enter your Account information, select your query and enter more information regarding your issue. Category of Complaints: Here you can see different types of categories from which you have to choose a category related to your issue. Products & Services: After selecting Category, you have to choose your option in Products & Services. Nature of Complaint: After selecting Product & Service, please select your option in Nature of complaint. Brief details of complaint: Now write a brief detail about your problem within 500 words. Just after filling all these details, click on submit button. After successfully submitting your query, you will receive your Ticket Number. You can track your complaint status using this ticket number. Your complaint will be investigated and resolved within 7 days. You will also receive a message about what action they have taken on your complaint. So in this way, you can complain online in State Bank of India and get a proper resolution of your query without visiting branch. I wish lodging a complaint with sbi was as easy as you have listed. In the category of complaints there is no space for complaints against activating a new debit card. Unless your debit is activated their services do not recognize the debit card no and the entire transaction is declared invalid. Again there is no space for a complaint against not receiving OTP for changing the digits in the PIN. Again the code for the String is so complicated that I keep getting repeated messages Special Character not allowed. What is a special character in the code. This system is ridiculous, you can create support ticket, but they will close that ticket as per their terms and their understanding, they event don’t think to ask/contact you, they will close it with any stupid reason which may not match with your complaint. There should be some team who can at-least listen the complain carefully and neutrally. I have complained several times get better response. I completely agree with you… SBI Customer care team will close the complaint without any valid reason..
One of d worst service that a customer receives is at SBI Bank…One deposit’s their hard earned money n faces issues to even withdraw them…Managers are even worst enough they just talk rudely ….Example is Barkatpura SBI Branch at Hyderabad.